April 8th, 4:00am. I am waking up, and just stepping outside of my buddy Jim’s back garage/apartment where I’ve spent the night. He’s just coming over from his house, opening the garage to check on me. By 4:30, we are on the road, him on his BMW 1200RT, me on my Yamaha FJR1300. WHERE TO? First to Ormond Beach, to walk down to the Atlantic Ocean, get a sample of sand and water from the beach. 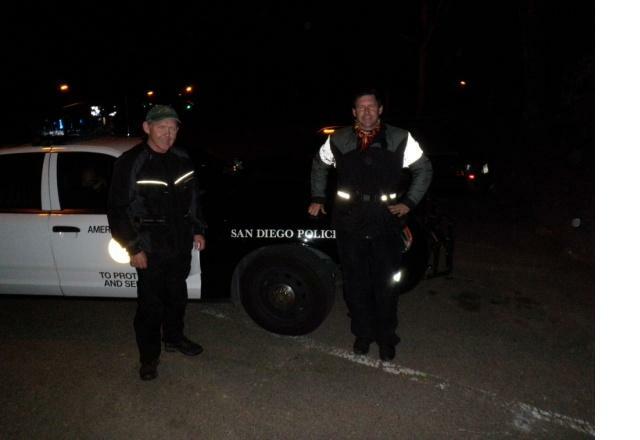 Texas, Arizona, New Mexico, California, BIG Winds, but finally, we make it to San Diego, CA. Coast to Coast in about 46 hours from leaving Jim’s house. We headed down to the beach, gather another sand and water sample from the PACIFIC Ocean this time. And headed to a hotel for a few short hours of rest. After another 4 hours or so rest, we gear up, and begin the 2600 mile trip back to Ormond Beach, FL. Heck, we even had time to stop and visit the ALAMO! No real stops the whole way back though. We rode straight through, only stopping at rest areas to sleep when we needed to. West Texas got a little crazy with some very high winds, then rain. We stopped there, Jim slept wearing his helmet, both to stay warm (it was VERY cold that night) AND to quieten the noise from the 18 wheelers that were running. That was it all the way back to Ormond Beach. We were VERY sleepy toward the end. BUT, 96 hours after we started, we had ridden our motorcycles from Coast to Coast to Coast 4 days. COOL! Jim has written a full comprehensive report of our trip, which I will post when I have time to go through it all. This entry was posted on Friday, July 9th, 2010 at 12:15 pm	and is filed under Motorcycles. You can follow any responses to this entry through the RSS 2.0 feed. Both comments and pings are currently closed.